The following video shows the progress that MAECI – Management and Economic Consulting, Inc. has made in the agriculture sector of Equatorial Guinea. 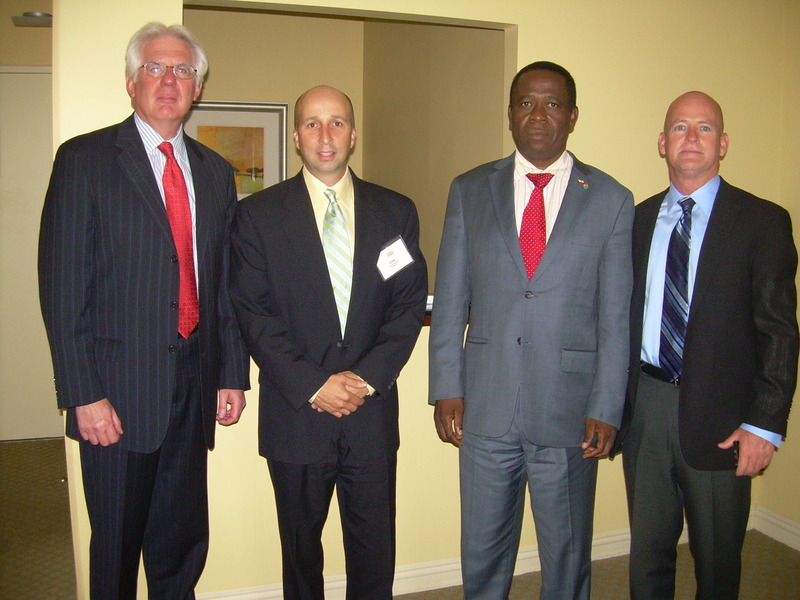 MAECI is a company based in the United States with contracts within Equatorial Guinea. MAECI was tasked with developing faming operations within 9 provinces around the country. MAECI has successfully executed on these projects, and additionally started projects within livestock. On June 11th and 12th, 2012, the Government of the Republic of Equatorial Guinea with the GHP (Greater Houston Partnership) organized the Forum on Attracting Investment, with the aim of highlighting the strategic commitment of Equatorial Guinea towards economic diversification, and to present investment opportunities in Mining, Oil, Telecommunications, Agriculture, Fisheries, Health care and Tourism. This event took place in the Hilton Hotel in downtown Houston. MAECI (Management & Economic Consulting, Inc.) hosted a delegation of U.S. companies that are interested in doing business in Equatorial Guinea, and the diversification mission described during the forum. MAECI’s guests included Leonard Karp, President & CEO of Philadelphia International Medicine, Scott Linde, President of Linde Corporation, Michael Hainey, Vice President of Blumberg Grains, and Selim Bora, President of Summa. MAECI’s guests were impressed with the professionalism of the event and presentations. They all came away with great excitement for the opportunities they see in Equatorial Guinea in the areas of Health care services and hospital construction, Food logistics and storage, Solar Energy and hospitality/Tourism. During the forum, investors listened to the speeches of different members of the Government of Equatorial Guinea, led by H.E. The President of the Republic, who provided extensive information about investment opportunities that have been generated in the country, from the Second National Economic Conference, held in 2007, and also from the National Industrialization Conference, which took place in 2011. The Investment Attraction Forum was inaugurated by the President of the Republic, H.E. Obiang Nguema Mbasogo, in a ceremony led by Genaro Peña, Vice President of GHP, in which the U.S. Senator Rodney Ellis also spoke. In his opening remarks, the Head of State thanked the American people in general, and the investors in particular, for the support shown to Equatorial Guinea. The President explained to the American audience the keys of the recent Constitutional Reform. This reform, he explained, has as its main objective to further deepen the comprehensive development of the nation, and keep it as a preferred destination for foreign investment, and especially American investments. After the opening ceremony, the thematic sessions of the Forum began. The first session was devoted to presenting the “Legal and Institutional Framework for the Promotion and Protection of Investments” and the second to “Diversification and Economic Growth in Equatorial Guinea”. The first session began with the presentation of the Minister of Foreign Affairs and International Cooperation, Agapito Mba Mokuy, who presented the keys to the new governance strategy of Equatorial Guinea. This strategy, in the words of the Minister, is specified in the recent Constitutional Reform that gives the State elements to ensure transparency in the public administration, while limiting presidential terms of office and creating new supervisory and consulting bodies. Next, the Minister of Economy, Commerce and Business Development, Celestino Bonifacio Bakale, presented the legal framework that guarantees the security of the investments in Equatorial Guinea, the benefits and incentives offered by the country as a destination for foreign investment. Then, the Director of National Bank of Central African States (BEAC), Ivan Bacale Ebee Molina, presented the economic and financial situation of Equatorial Guinea, and its contribution of sub regional GDP. 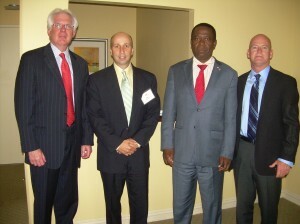 The Director of BEAC showed the strengths of the banking system in Equatorial Guinea and the trends in major macroeconomic aggregates, and finally, invited the American businessmen to invest in the sub region of Central African, in general, and in Equatorial Guinea, in particular, given the positive outlook of the country’s economy. For his part, the Vice Minister of Planning, Public Investment and Economic Development, Valentin Ela Maye, presented the Plan for Economic and Social Development of the Horizon 2020 Agenda, and the level of implementation of the first phase of the Horizon (2007-2012). Ela Maye told the audience that the first phase was successfully completed and that the foundations (infrastructures, public governance, human capital and social welfare) were ready. For the emergence phase, 2012-2020, the Government counted on direct foreign investment, especially from the United States, to carry out the dream of an emerging Equatorial Guinea in Horizon 2020. The second session continued with new and numerous speeches that informed the interested investors on the current economic situation and on many other areas of Equatorial Guinea. Under the heading “Diversification and Economic Growth in Equatorial Guinea”, this second session began with the intervention of the Delegate Minister of Agriculture and Forestry, Diosdado-Sergio Osa Mongomo, who explained to the audience the current status of the national agricultural sector and the Government’s plans to promote agro-industrial development of the nation. The Minister placed special emphasis on the most promising products, recalling that cocoa in Equatorial Guinea, because of its quality and reputation in the markets, is the flagship product of agriculture production. After the speech by the Delegate Minister of Agriculture and Forestry, the Secretary of State for Technology and Telecommunications took the floor, Carmelo Martin Modu Ebuka, who described the efforts being carried out by the Government of Equatorial Guinea to create an information society in the country, including key projects such as the backbone and the fiber optic connection from around the country. Finally, to close the meeting, the Minister of Mining, Industry and Energy, Gabriel Mbaga Obiang Lima, presented the investment opportunities in mining and hydrocarbons, first explaining to the audience the implications and connotations of the sector in Equatorial Guinea. “The extracting sector is the hope,” said the Minister, who also recalled that “the prosperity we enjoy today in Equatorial Guinea has its origin in the efforts made by the Government and in the capitalist spirit of American society, since it was a U.S. company that made possible the commercial exploitation of our oil”. Mbaga Obiang Lima also said that Equatorial Guinea is ready for takeoff in the mining sector and that the American private sector has reserved, in consideration, a major role in this chapter. The Minister of Mines also explained all the developments in the hydrocarbons sector and the regulatory context, inviting the American businessmen to obtain the free blocks remaining in the oil map of the nation. The forum ended with the words of the President of the Republic, who, on behalf of the people of Equatorial Guinea, thanked the city of Houston, its institutions and employers, for the massive support he had received at the meeting. In the general framework of the events, the following day, June 12, the signing of the memoranda, agreements and oil contracts took place, which sealed the strength of the partnership of the American companies and the Government of Equatorial Guinea. MAECI has secured commitments from the U.S. companies in attendance to travel with them as part of a U.S. delegation of Commerce to Equatorial Guinea in the upcoming months.